Thirty-three scientists from around the world, including one co-leader from the U.S., are collecting rock samples from the Chicxulub impact crater in the Yucatan Peninsula. Scientists digging deep into the Gulf of Mexico say they have cracked into a crater, formed some 65 million years ago after a massive asteroid struck Earth. 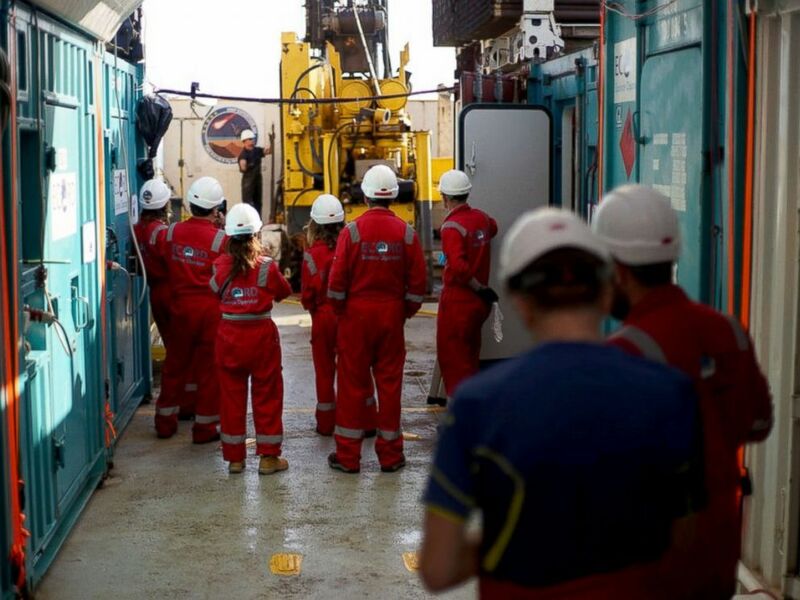 The 33 members of a team of scientists from around the world, assembled by the International Ocean Discovery Program and in coordination with the European Consortium for Ocean Research Drilling, are collecting rock samples from the Chicxulub impact crater in the Yucatán Peninsula that they say hold clues about the history of life on earth. Calling from a drilling platform in the Gulf of Mexico, geophysicist Sean Gulick of the University of Texas, a co-leader of the expedition, told ABC News, "The extinction event caused 75 percent of life to go extinct on Earth, including the dinosaurs. Thus determining the potential causes, or kill mechanisms, is a very important step forward in our understanding of the history of life on Earth." "One aspect that we are studying by driving into the Chicxulub impact crater is the impact event itself — including potential kill mechanisms and the recovery of life after the asteroid struck." The crater is about 125 miles wide and 12 miles deep. "It is the best-preserved large impact on Earth, the only one linked to a mass extinction event and the only one with a confirmed peak ring," Gulick said. "In 1996 and again in 2005, we used seismic data to image beneath the limestone that bury the crater to see its key features, including the ring-shaped faults, crater rim and peak ring," geophysicist Joanna Morgan of London's Imperial College, another co-leader of the expedition, told ABC News. "We decided if we could drill in only one location, drilling into the peak ring was the best target," she said. "It was shallow, so the drilling would take less time and cost less. It would tell us whether the impact models were correct and it had the best chance for preserving evidence of impacts being used as habits for life that can live off chemical reactions, as opposed to sunlight (chemosynthetic organisms)." They hope to finish collecting samples in June, then send samples to a lab in Bremen, Germany, where they will be "split and studied with much great precision" Morgan said. The process of analyzing the rocks for evolutionary patterns, to help decipher what happened after the massive asteroid hit the earth, will likely take years. But researchers are hopeful that having this access to the Chicxulub crater will reveal a lot about what happened to the dinosaurs and other life. "We expect to get some exciting results in several stages moving forward," Morgan said.